William Steig’s picture-book cartoon character, Shrek!, shot to fame in the 2001 DreamWorks animated film and reserved his iconic place in family-favourite history. Boasting a larger than life cast of characters, including a zealous talking donkey and subversive princess, the colourful story was a super selection for musical conversion in 2008. Ten years on, the musical is touring the UK. It was a shame to see such a sparse audience at the Bristol Hippodrome. No doubt it’s a demoralising challenge when the energy of a production is zapped by an empty auditorium in such a large space. And yet there are several huge performances deserving praise. Steffan Harri greens-up to play the lovable stink with wry humour and a bouncy step. He is well-matched by his furry friend, Donkey, played by Marcus Ayton, who oozes with cheek and sass. It’s great to hear many of the classic lines from the film, which is rife with layers – like onions, like ogres, in fact – but, at times, the writing seems to hold these characters back and there are some poorly managed, purposeless entrances and exits that left the performances a little ropey around the edges. Part of this is to do with the simplistic set design, pared down for the tour. Although effective and usable, it doesn’t wow like other big musicals on tour and some of the stripped-back stand-in features mean that the fairytale magic is lost. The pantomime villain is always a gift of a role and Samuel Holmes stands up (ahem!) to the demands of Lord Farquaad’s ‘small’ part. His appearances keep the audience tittering at his comical lines and brilliantly funny attempts to cross the stage at speed on his tiny legs -a gimmick that never seems to get old. Unfortunately, reality TV star, Amelia Lily is the one who falls short as Princess Fiona. Her vocal talents are well showcased but not matched in her dancing or acting ability, clarity and precision being the main concerns. She is overtaken by some excellent work from the saving-grace Ensemble though and it’s this super bunch whose appearances make the show. This is a fantastic show for the Ensemble who each assume their own supporting role in the brigade of misfit fairytale creatures, cast by physically and psychologically dwarfed Lord Farquaad into the squalor of Shrek’s swamp, due to their oddities. Tim Haley impresses here with super costumes for all the proudly freaky fairytale creatures, each charmingly unique and full of style. The Ensemble do a credible job with their many costume (and shoe and hair and make-up) changes to also play villagers, guards, tapping rats, blind mice and the cutesy chorus line of Dulocians. (There are some super time-lapse videos of these quick changes on the twitter feed). Their appearances are punctuated with Josh Prince’s choreographic arrangements, under Hugh Vanstone’s fun, colourful and engaging lighting design, bringing the ‘Big, Bright, Beautiful World’ to life. Among them, Lucinda Shaw’s vocals – behind Tim Haley’s four-man dragon puppet – are on fire. And tiny Jemma Revell also packs an awesome punch flipping between the dainty Sugar Plum Fairy and the hearty belt of the adorably silly Gingerbread man. Jennifer Tierney, as Mama Bear, is another vocalist to note, while her fun-loving on stage husband, Kevin Yates, entertains with some groovy dad-dance moves. The music has some real highlights with winning references to a host of other shows to satisfy musical geeks in the audience: the Les-Mis inspired ‘Freak Flag’ was a great ensemble number, as were the Duloc parodies of 42nd Street and A Chorus Line. ‘I Think I Got You Beat’ appealed to the masses for its primitive, coarse humour contrasting to the classic musical sing-off duets such as Annie Get Your Gun’s ‘Anything You Can Do, (I Can Do Better)‘, a slightly less gaseous take on competitive flirting. It was a shame to see the wonderful trio version of ‘I Know It’s Today’ omitted in favour of interaction with tacky puppets. This was a great number in the original and exemplifies several cuts that haven’t seemed to benefit the revamped tour. But we left the theatre on a high after the keenly-awaited karaoke-swamp party finale, which drew the better half of the performance to a neat close. This was a mixed bag of a musical, showcasing a number of hardworking and talented performers, but not quite living up to the original west end production. Starting a blog and sharing your writing publicly takes courage. You open yourself up to exposure and criticism; share very personal thoughts and reveal your weaknesses; all on a very public stage. It’s true that ‘the water does not flow until the tap is turned on’ so here I go, exercising, experimenting and making merry mistakes to learn from. Blogging has made me braver about sharing other work too and I’m relishing being the learner (as opposed to the teacher) in receiving feedback. I thoroughly believe we are all able to learn if we can open our hearts to hearing criticism constructively and using information practically and purposefully in order to improve our skills. Aliventure’s writing blog and email newsletter is full of advice and friendly encouragement. Despite her popularity and busy life, she even finds time to reply personally to email responses to her newsletter. I discovered her network via google when I read some of her excellent blog posts and articles. You can find her on Facebook or this is her blog page. I was inspired to take the leap when reading the brilliant book blog of a friend and ex-colleague who worked her way through maternity leave reading and reviewing books. Her lovely blog is articulate and engaging but costly as I come away wanting to go and buy everything she reviews to read! I love reading children’s books as I am always looking for inspiration for theatre ideas and youth workshops. Another great book reviewer that I’ve discovered is Julia who dips into adult and children’s books on her blog and Twitter. 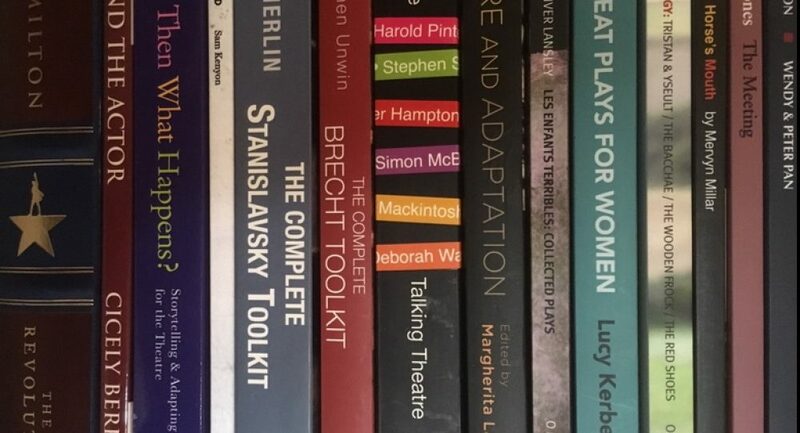 It’s been great to start uncovering some of the theatre blogging community, particularly regional or specialists in their field. Flossie Waite is an excellent blogger whose Children’s Theatre Review blog is important because it actively promotes children’s theatre in order to spread the word and help the movement grow. This is yet another blog that makes me want to spend to go and see all the glorious productions developing across he UK. Please do take a gander at Flossie’s blog and be sure to read the paragraph at the bottom of each of her blog posts which explains how we can support her cause. Another great theatre blogger I enjoy reading is Debbie at Mind the Blog. who is currently on an Edfringe reviewing mission that I am enjoying via twitter (@mind_the_blog) while harbouring Fringe withdrawal symptoms myself! In this blog I hope to exercise my writing skills and to share my love of theatre. I will be writing about theatre from my experiences as a director, performer, teacher and audience member. I aim to include reviews, books reviews, case studies, research and creative writing around the topic. If you have feedback, a question or topic suggestion, please do get in touch via the contact page.